Be informed about the activities of the Hi-Tech Wild-Trek trailer by receiving an e-newsletter. Send your email address to us and we will add you to the mailing list. You can un-subscribe at any time. Pick up the phone or send Richard an email. 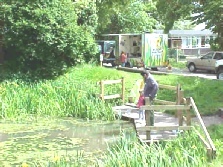 You can check the trailer’s bookings diary and read about our terms and conditions on our Booking Information page. The core element of Hi-Tech Wild-Trek is the HD video camera that gives close up views of small creatures. These are displayed on the main screen at roughly 25 times life size. A separate microscope camera is also available for the smaller items. A computer provides the means of grabbing still images that can be printed out and a file of images forms part of the habitat record. The moving images are recorded digitally.. A further screen shows database output or archive material. Catching, handling and identifying of animals is fully supported by the nets, trays, pots, and ID sheets carried on board. Hi-Tech Wild-Trek likes to work as close to the habitat as possible. 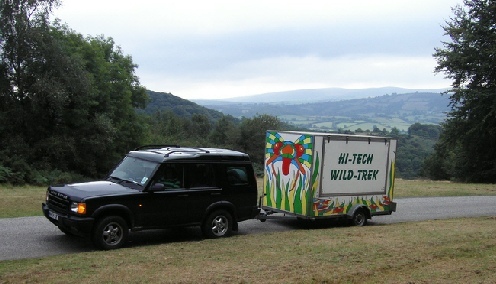 The Hi_Tech Wild_Trek trailer is a unique facility for exploring the natural world. Ponds, streams, seashores and a variety of terrestrial habitats can all be investigated. The smaller animal inhabitants are recorded by digital imaging techniques and then returned to the wild.